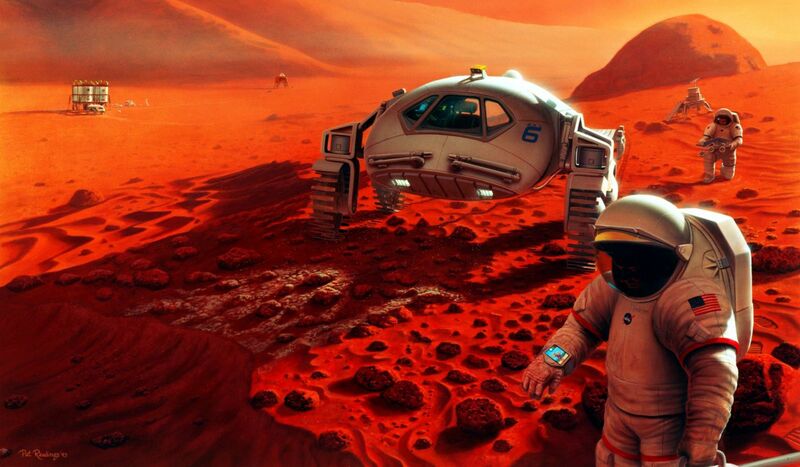 A new study by researchers at the University of Nevada, Las Vegas (UNLV) suggests the cancer risk for astronauts on a mission to Mars could be higher than expected. The results of the study were published in the May issue of Scientific Reports and show the risk is effectively doubled compared with previous models. The study builds off of previous research that has suggested prolonged exposure to galactic cosmic radiation can cause cancer, cataracts, circulatory diseases, acute radiation illness, and effects to the central nervous system. While protons are primarily responsible for the absorbed radiation doses in the study, significant contributions were also noted from heavier ions, low energy protons and helium particles, and neutrons. Cucinotta has a background in studying the effects of the radiation environment of space. Current radiation risk models assume DNA mutation and damage are the primary cause of cancer, which assumes all cells are impacted by cosmic rays over a short period of time. The new study examined how cancer risk is affected by how healthy, bystander cells are impacted by cells heavily damaged by cosmic rays. The results indicated at least a two-fold increase in cancer rates compared to current risk models. Cucinotta said the study’s findings underline the need for more research into the effects of cosmic ray exposures under Mars mission constraints. Much of the existing body of research has focused on cosmic ray exposure on long duration missions within Earth’s geomagnetic sphere, such as extended flights on the International Space Station. Cucinotta also said this raises a moral question of sending astronauts to Mars with such a high cancer risk. “Waving or increasing acceptable risk levels raises serious ethical flags if the true nature of the risks [is] not scientifically understood,” Cucinotta said. Protecting astronauts from the heavy ion component of cosmic radiation and from major solar events only requires about 20 centimeters of water shielding. 30 centimeters of water shielding would expose astronauts to less than 30 Rem per year of cosmic ray exposure during solar minimum conditions. 50 Rem per year is NASA’s limit for astronauts. The weight penalty resulting from the enhanced water shielding is something that NASA– simply has to accept– in designing its interplanetary architecture. The obvious solution is to generate a magnetosphere on interplanetary transport spacecraft. That wouldn’t​ stop high energy cosmic rays but it would deal with the solar radiation. That should bring the risks down to similar levels as long duration LEO missions. The paper is essentially a computer modeled study, and is somewhat speculative, in my mind.